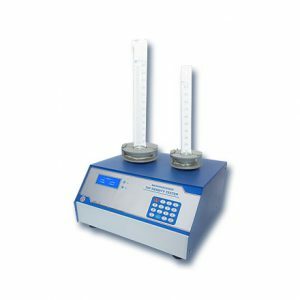 Tap Density Tester – 1951 | Electronics India - Manufacturer, Supplier and Exporter of Analytical, Scientific Laboratory and Pharmaceautical Instruments in India. Microprocessor Tap Density Tester, Model 1951 is a density measurement equipment used to measure tapped density of powders, as well as granulated or flaked materials by standardized and repeatable procedures. Instrument uses the latest microprocessor technology and advanced engineering techniques so as to give enhanced accuracy and reproducibility. System is equipped with 4 line alphanumeric LCD display with backlit and 16 number of soft touch membrane type keys. The unit is provided with two motorized platforms which allow for 14 ± 2.0 mm drop height for the USP Method I version, and a 3 ± 0.2 mm drop height for the USP Method II version. The motorized platforms consist of two cylinder holders with snap-lock mechanism designed to hold 100 ml and 250 ml cylinders. The simultaneous rotating and tapping motion minimizes any possible loss of mass during tapping down. The instrument stores the test parameters, readings and results simultaneously in the memory which are retained even after the power is switched OFF. Provision has also been made for attachment of a printer so as to provide hard-copy printouts of test data, including the time, date and calculated results.